Space Shuttle Endeavour sits inside the Vehicle Assembly Building at the Kennedy Space Center in Florida on Friday, November 25, 2011. It is being prepared for its journey to the California Science Museum where it will be put on public display. The Mars Science Laboratory’s rover Curiosity is scheduled to launch Saturday from Cape Canaveral Air Force Station. Curiosity with its capability to detect signs of life will be the most sophisticated vehicle ever sent to Mars. The journey to the red planet is not the only event that is creating excitement on Florida’s space coast this week. The Vehicle Assembly building, where space shuttles and Saturn five moon rockets were assembled, is now open to the public. Touring this building, which has been closed to the public since 1978, may not be the highlight, even if it is one of the tallest buildings in the world. 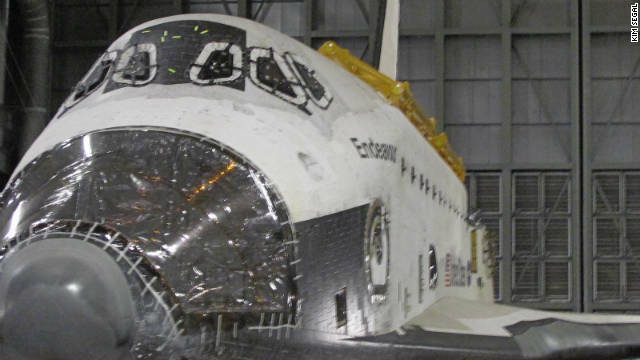 "It's a great bonus to come in, not only to be in awe of the inside of this facility," says Stine, "but then seeing Endeavour being prepared for its trip out West." The trip is scheduled to take place in late 2012, when the orbiter will be moved to a public display at the California Science Center. Until the move visitors taking the KSC Up- Close tour will enter the VAB and see Endeavour as it is being prepped for its west coast retirement. I was at the VAB two days ago. What a treat to see! Will there be a schedule posted as to what days the VAB will be available? Hate to make a long trip to only find out that the building was closed that day.